In keeping with the last posting, this is also from a stop motion commercial. It was for a Qualityville Products TV spot created at Cascade Pictures in about 1970. Cascade Pictures was a major provider of visual effects, stop motion and cartoon animation for commercials for (I believe) the late 1950s through the mid 1970s. I was fortunate enough to work there and get a terrific real world visual effects education. Can you tell us alittle bit more about what you are doing in this picture? Everything in the scene had to be animated by hand frame-by-frame. The major challenge was the airship which is suspended on an overhead rig. It could pitch up and down and the motion was tracked with a pointer on the white card over the center of the balloon. In addition to the flight of the airship, each character had to be individually moved each frame. The three individual “train” hand-carts also traveled down the track during the shot. How much stop motion would you say you’ve done in your career and when did it become ‘obsolete’? I’ve also noticed that stop motion has been more and more popular lately, as well as the hand made look that stop motion seems to provide. Why do you think that is? Is it cheaper? It’s certainly not easier. My first filmic experiments were with stop motion back in the 1960s. I did a number of short films in college, although they were as much about visual effects as stop motion. While at Cascade Pictures I was able to do a couple of Pillsbury Dough Boy spots along with a few Mrs. Butterworth commercials. 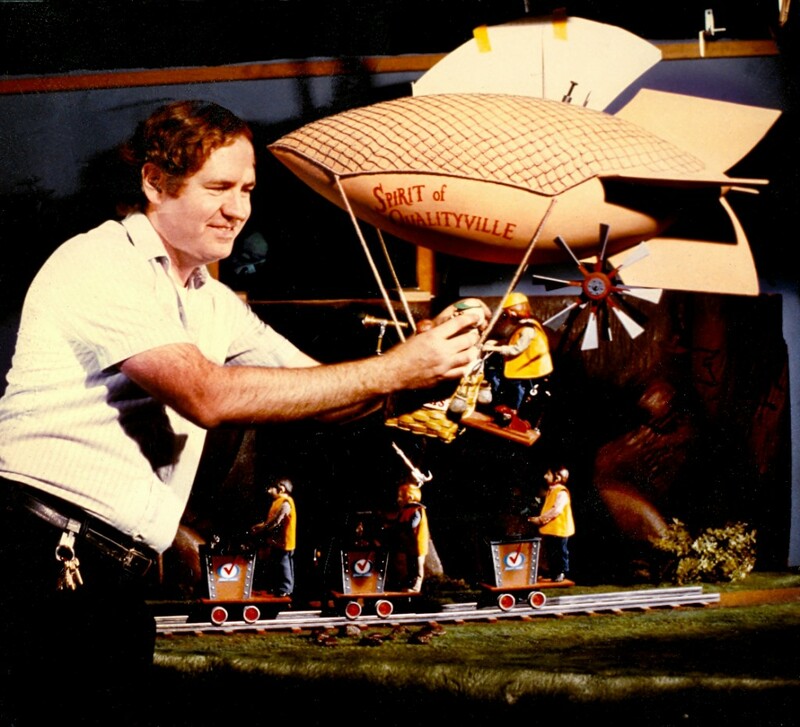 Many of my commercial experiences involved technical stop motion such as animated cars or objects. It seems that stop motion took a dive after Jurassic Park came out. Of course, as with every “new and better” technique, everything had to be CGI or it wasn’t up-to-date or good enough so many of us thought that stop motion was pretty much dead. We are fortunate that people with artistic sensibilities (and power), like Tim Burton, could keep the look and aesthetic of stop motion alive. Stop motion has a different look and style that is all its own. I am glad that audiences will still pay to see it. Speaking of trains… Got any pics or other info about that huge train miniature that you were talking about with me an John the other day? I’d LOVE to see that train! And yeah, the “honeymoon” with CGI has long worn off at this point, and there is a returning to SM, as, like you said, it has a very unique look and feel, With the overtaking of CGI, it has become “new” and/or “fresh” again, in regard to a style that filmmaking and/or advertising markets would go for. It will never usurp and/or supplant CGI for photo-real efx work at this point, but it still definitely has a marketable quality in other areas. I for one am happy to see peeps continuing to carry on and practice the art-form. I miss it myself a bit, eh.